This topic contains 3 replies, has 2 voices, and was last updated by Silvan 3 years, 7 months ago. 13:21:39 : Using Calamares settings file at "/etc/calamares/settings.conf"
13:21:39 : Using Calamares branding file at "/etc/calamares/branding/openmamba/branding.desc"
13:21:39 : WARNING: the selected branding component does not ship translations. 13:21:39 : Loaded branding component "openmamba"
13:21:39 : Loading module.desc for "bootloader"
13:21:39 : Loading module.desc for "displaymanager"
13:21:39 : Loading module.desc for "dracut"
13:21:39 : Loading module.desc for "dummyprocess"
13:21:39 : Loading module.desc for "dummypython"
13:21:39 : Loading module.desc for "finished"
13:21:39 : Loading module.desc for "fstab"
13:21:39 : Loading module.desc for "grubcfg"
13:21:39 : Loading module.desc for "hwclock"
13:21:39 : Loading module.desc for "initcpio"
13:21:39 : Loading module.desc for "initcpiocfg"
13:21:39 : Loading module.desc for "initramfs"
13:21:39 : Loading module.desc for "keyboard"
13:21:39 : Loading module.desc for "locale"
13:21:39 : Loading module.desc for "localecfg"
13:21:39 : Loading module.desc for "machineid"
13:21:39 : Loading module.desc for "mount"
13:21:39 : Loading module.desc for "networkcfg"
13:21:39 : Loading module.desc for "openmamba-postinstall"
13:21:39 : Loading module.desc for "packages"
13:21:39 : Loading module.desc for "partition"
13:21:39 : Loading module.desc for "removeuser"
13:21:39 : Loading module.desc for "services"
13:21:39 : Loading module.desc for "summary"
13:21:39 : Loading module.desc for "umount"
13:21:39 : Loading module.desc for "unpackfs"
13:21:39 : Loading module.desc for "users"
13:21:39 : Loading module.desc for "welcome"
13:21:39 : Initial locale  "en_US"
13:21:39 : xkbmap selection changed to:  "us" - ""
13:21:40 : Cannot open file "/etc/locale.gen" . Assuming the supported languages are already built into the locale archive. 13:21:40 : A battery exists, checking for mains power. 13:21:46 : Selected locale "en_GB"
13:21:54 : CreatePartitionTableJob::createTable trying to make table for device "/dev/sda"
13:21:54 : Updating partitioning preview widgets. 13:21:55 : Updating partitioning preview widgets. 13:21:55 : ## Device: "ATA VBOX HARDDISK"
13:21:55 : - "Create new msdos partition table on /dev/sda." 13:21:55 : - "Create new 25702MB partition on /dev/sda (ATA VBOX HARDDISK) with file system ext4." 13:21:55 : - "Create new 8708MB partition on /dev/sda (ATA VBOX HARDDISK) with file system linuxswap." 13:21:55 : - "Create new 227726MB partition on /dev/sda (ATA VBOX HARDDISK) with file system ext4." 13:22:15 : PartitionCodeModule has been asked for jobs. About to return: "Clear all temporary mounts. Create new msdos partition table on /dev/sda. Create new 25702MB partition on /dev/sda (ATA VBOX HARDDISK) with file system ext4. Create new 8708MB partition on /dev/sda (ATA VBOX HARDDISK) with file system linuxswap. Create new 227726MB partition on /dev/sda (ATA VBOX HARDDISK) with file system ext4. 13:22:15 : Gathering UUIDs for partitions that exist now. 13:22:15 : "" mtpoint: "/" fs: "ext4" ""
13:22:15 : "" mtpoint: "" fs: "linuxswap" ""
13:22:15 : "" mtpoint: "" fs: "ext4" ""
Now the reason why I said “may be related to KDE” in the title is that I know that Calamares also has issues (not quite the same, but still related to graphics) in Sabayon KDE edition, see this post on the Sabayon forums for details. This topic was modified 3 years, 7 months ago by fusion809. Thanks for reporting the problems with details to help us fix them. Calamares was recently updated in openmamba but I could not do extensive tests so far. About the most importat problem, did you choose automatic partitioning of the whole disk? This is a function I have patched for openmamba and which needs more testing, because I suspect wrongly calculated partitions might cause the crash. So if this is the case I would suggest you to try with manual partitiong and see if it works, as I haven’t patched anything there. This reply was modified 3 years, 7 months ago by Silvan. I was using automatic partitioning, but I just tried manual (MBR, single 256 GB ext2 partition, if relevant) partitioning and it resulted in the same crash. 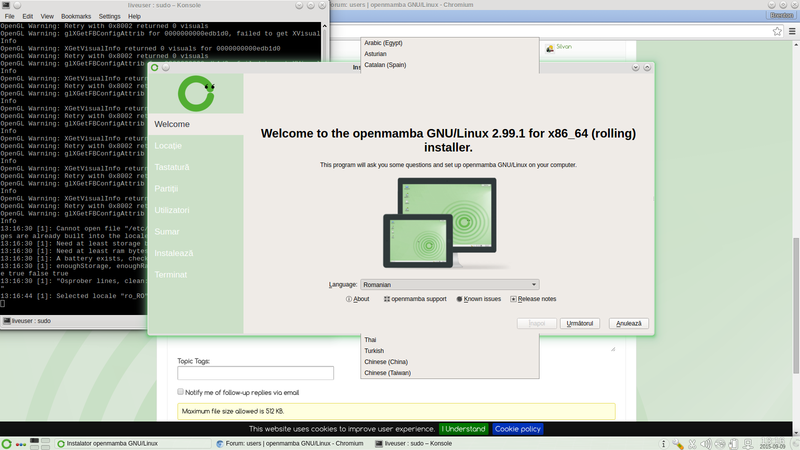 I’ve just tried installing openmamba-milestone3-livecd-it-snapshot-20150908 on both libvirt and VirtualBox virtual machines and could not repoduce the problem. as a workaround, did you try installing on a partition that already exist, i.e. without telling Calamares to change any partition?